Although it has been nearly four years, I can remember making the trip to Children’s Hospital like it was yesterday. It was a Sunday afternoon in February when I checked my son’s blood sugar with my monitor. As soon as I saw the result, I knew what it meant. Nick’s blood sugar was very high. I recognized the symptoms and understood the reading because of my history as a Type I diabetic. Diagnosed as a child, I have been a diabetic for over forty years. Diabetes care has changed dramatically since I was a child. There were no electronic meters then. But, I still remember hearing the news that I needed to go to the hospital. As a seven year old I understood what it meant to be a diabetic because I watched my older brother take his shot every morning. He was diagnosed at sixteen months. As my wife Lynn, Nick and I walked into Children’s Hospital my mind raced in two directions at the same time. Memories flooded in. I couldn’t help but remember how I felt when I was walking into the very same hospital. I remember how I began to wrestle with the prospect of taking a shot every day. I knew what it was like walking into the hospital as a child. Now I was discovering what it was like to be the father. In the moment, my thoughts were shifting back and forth between the past and the future. I wondered how Nick was feeling. How will diabetes affect Nick’s future? My mind raced forward to the responsibilities that Nick faced ahead. In his book, Summoned to Lead, author Leonard Sweet suggests, “Crisis doesn’t make a person. It reveals you for what you are. You don’t know who someone is until adversity comes. It shows the cracks, and the cracks are where God leaks through”. I began to realize how I had been blessed with parents who allowed God to “leak through” in their care, encouragement and guidance when I was a child. Now it was my turn. To be sure, fatherhood is an adventure. That’s an understatement. It stretches me. It is filled with creative tension. Not every father experiences Type I diabetes with a son. However, all fathers do experience unexpected trials. Life is a constant mix of past, present and future. What we do with that “mix” shapes our fatherhood. If I am wise and I muster the courage to do so, I will reach back and glean from past experiences, both good and bad and take the time to share them with Nick. If I am honest about those experiences, Nick will learn as much from my integrity as he will from my words. Those times of sharing are irreplaceable opportunities to speak encouraging words into his “present” life. Most dads recognize how quickly those opportunities can slip away and how difficult authenticity can be. But the rewards are worth the risk. As valuable as it is to reflect, it is equally important to look ahead. When Nick and I talk about what the future holds, it is both exciting and unnerving to gaze toward the horizon together. 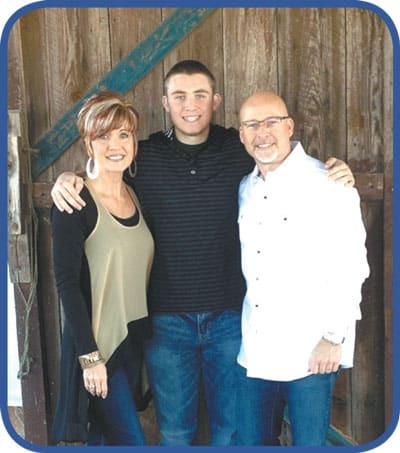 As a father, I am blessed to be a part of Nick’s transformational passage toward maturity. None of us is able to see the potential in our children with the clarity and precision that God possesses. But, it is not my responsibility to “know” Nick’s future. Instead, we prepare for the future together. I take comfort in the wisdom of the Proverbs. The Proverbs describe the importance of discipline and a willingness to deposit wisdom into Nick’s heart. As Nick’s physical stature has increased, it is most gratifying to see the development of his heart and his character. It’s hard for me to believe that Nick is a sophomore at Christian Academy of Knoxville. I am so proud of Nick. Balancing diabetes with a busy schedule of church activities, academics and high school basketball is not easy. All the clichés about time are true. But rather than complain about how quickly the days pass, I hope I will choose to be a wise steward of the opportunities that God provides in each season of life. Truly, every day is a gift. Paul Metler, Ph.D. serves as senior pastor of Heritage Fellowship Church and is a board member of Christian Academy of Knoxville. He and his wife Lynn have been married for 24 years and have one son, Nick. What a great family. I have had the priviledge to coach Nick at CAK Middle School Football. I was taught a little about Nick’s sugar levels during his time as a middle schooler. I do not ever remember Nick missing a game. He was very consistant checking his sugar before, during and after practices and games. Boy, was that a lesson for the future. My son Clay Powers graduated from CAK spring of 2012. Four days prior to him reporting to football practice last August at KY.Wesleyan College (4.5 hours from Knoxville) he was diagonised as being diabetic. What an unexpected shock to me and my wife and of course Clay. We managed to pull it all together mentaly and physicaly- and he made it to college football practice on time. Wow!!!! I look back now and what a blessing the Metlers taught me 4 yrs, ago. GOD for sure knows what he is doing. HE helped me prepare for my son Clay’s diagnosis. I don’t know if I could have handled it if i had not been unknowingly educated by the Metler family prior to dealing w/my son. My wife, Jay Ann, did not want him to be so far away at college after hearing about his physical. I told her that he will be ok. That lots of players are diabetic including Drew Breeze new orleans QB. She didn’t care cause her baby was too far away to take care of. After educating ourselves of our sons diagnosis, how it will be treated etc. we finaly agreed it’s ok for him to go attend college and play ball that far away. Without GOD introducing me to the Metler family I may have had a stronger view about sending him off to school. Can you imagine a 19 yr. old leaving home for the first time ever 4 days after being shown how to give himself a shot(s) every day!!!! I probably would have told Clay to stay at home. But, seeing, experiencing Nick play w/ and through this I was convinced to allow Clay to go persue one of his dreams. Thank you LORD for guiding me and family through this w/out any regrets. Oh, and Lord thank you for introducing me to the Metler family. YOU are GREAT!!! !